I had an excellent dinner at Anthony's Pier 66 in downtown Seattle recently. I was in town on business and a group came here for dinner as the guests of on of our business partners. It was a great choice. First of all, the ambience... I had never been to Seattle before, but we were downtown on a beautiful summer evening, clear and sunny. From my seat, I could see the Cascade mountains on one side--and the moon about to set over then--and Mount Ranier on the other. It was a great setting. There were a dozen of us and were were very well taken care of by a competent waitstaff, very well taken care of. We started off with drinks--I had a local brew, and ale. We had quite a selection of appetizers to start with. They included the Pier 66 Tower, Pan seared beef, Coconut prawns, and Mussels, and they were all very good. I started my meal with a fresh salad featuring local produce including raspberries and blueberries, goat cheese, walnuts, and fresh greens. It was excellent. For my entree, I chose a combination of Fresh Alder Smoked Salmon and Fresh Alaskan Halibut, served with garlic mashed potatoes and green beans. Oh. My. God. 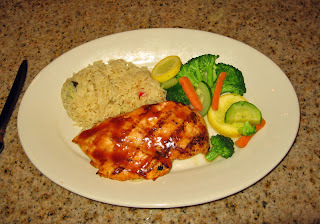 The salmon was out of this world tender, juicy, and flavorful. It was truly the best salmon I'd ever had. We were told that it was the very end of the season for the run of the King Salmon, and that's what we had. Well, it was certainly outstanding. The halibut was also very good too. And, because they were nearly out of halibut that night (our party consumed the last of it), the brought me more salmon as they though my halibut portion too small. No matter, it was all exceedingly delicious and definitely "to die for." Everyone in our party agreed that the meal was exceptionally good, and everyone left well satisifed. Definitely, 100%, without a doubt, good eats! I am no sushi expert, and have rarely had it, but my experience at Sushi Connections Restaurant recently was a very good one. Imagine sitting at a counter where a belt goes past, and on that belt are little plates of sushi. The belt is endless, but you just pick out what you want and the sushi chefs on the other side keep a constant vigil, ensuring the selection is varied and the food is plentiful and fresh. I was fortunate to sit next to my friend and coworker Jimmy who was able to be my guide and we shared a few plates. I had quite an assortment of sushi, from a shrimp roll to white tuna to salmon and red tuna and even a plate of seaweed--it was quite tasty though the texture was something new to me. As a matter of fact, I enjoyed every bite i put into my mouth. The lunch special as $2.10 per plate and when it was all over, I had six plates stacked up. Not bad. I got past any sort of mental block I had about raw fish and really enjoyed my meal. I'd have kept eating if I'd had had more room in me! I was almost up for trying the eel, but I think I'd need a few beers to do the octopus. Then again, you never know. Now that I've had a good assortment of sushi, I want to have some again. And again. And again! I had a nice lunch at Chan's Place in Woodinville when I was in the Seattle area recently. I started my meal with the Hot N Sour Soup, one of my favorites. Their's was pretty good, not the best I've ever had, but certainly above average, filled with all the various flavorful stuff that a good soup like this should be. I pronounce it "yummy." For my lunch I had the General Tso's chicken and Buddha's Delight along with some Pork Fried Rice. The General Tso's could have been spicier/hotter, i prefer it that way. It seemed a bit tame for me, but it was good nonetheless. The veggies of the Buddha Delight were very fresh and just slightly cooked, nice and crisp. And the rice was good too. Overall, this was a very nice meal and I enjoyed my lunch a lot. I'd say it was definitely good eats! I had never eaten at a Teriyaki place before, but my journey to Sushi'n Teriyaki for lunch in Woodinville recently was a pleasant surprise. I was in the Seattle area on business and it being lunch time, me being hungry, and eating on an expense account, I ordered a large combo, number 15 if I recall correctly. My lunch was more than I could eat, it turned out. I had a spring roll (pretty ordinary, but good), potstickers (delicious) and teriyaki chicken (also very good), all served with jasmine rice. It was a good meal for a good price and I enjoyed it a lot. Good Thai food in a quaint setting, that's my first impression of my recent visit to Pen Thai Restaurant. I was in Seattle on business and some of the locals took us here for lunch, it was a great choice. There were about a dozen of us all told, and we were smart to get there a bit before the lunch rush, they were pretty busy, a testament to the good food. Lunch at Pen Thai comes with a bowl of soup. For the life of me I cannot remember exactly what kind of soup it was, perhaps a miso soup, but it was very good and tasty and I know I enjoyed it. All I can say is that I tried a bit of each dish and seconds of many. Everything was all very, very good. I think my favorite may have been the beef. Or maybe the pad thai. Or maybe... well, it was all very good. If I lived in Seattle, I'd be over here a lot! I had the good fortune to eat at Craftsman recently and was thoroughly pleased with my dinner. I was in Minneapolis basically for a day and my "tour guide" sister--Jean--also a vistor though a frequent one, guided me to Craftsman for dinner--I'm so glad she did because the meal we had was very nice. We started off by perusing the beer menu (this is Minnesota, after all!). They had a number of good beers on the menu and we each had several of the ales. So very good! For an appetizer, we started off with the Pork Rillettes. Pork had been slowly cooked in fat, then shreeded and cooled to room temperature, much like a pate. It was served with sone crostini and apples and mustard. I will point out that, whatever the mustard, it was superior, I loved it. The rillettes were very good as well. I ordered a side salad to go with my meal, and it was properly served before the meal as I'd requested. It was a salad of mixed micro greens, dressed with a delicious mustard viniagrette and a splash of pea oil. It was delicious. 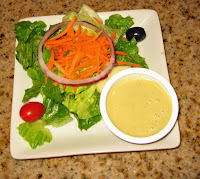 The spicy bite of the greens was complimented well by the mustard and vinegar flavors. I loved it! In due time, our main courses arrived. And boy, did they arrive! My sister Jean ordered the Leg of Duck Confit. Wow, it was outstanding! The duck was amazingly tender and flavorful. It fell right off the bone. It was extremely flavorful. The duck confit was served with a Potato Onion Gratin. This too was very good. you could taste the potato, the onion, and the cheese/cream that bound it all together. The dish was fininshed with some more of the aforementioned pea oil and a bit of the duck jus. It was very good and I'm happy to report that Jean cleaned her plate! For my entree, I had the Grilled Pork Chop. When it first arrived, I suspected it may have been overcooked, because it seemed a bit difficult to cut. But as soon as I took a bite, I knew I was mistaken. The pork was wonderfully cooked, tender and flavorful and not at all overcooked. It was served with some buttermilk pureed potato--that could have used a bit of salt, it was a bit bland. And served with some horseradish creamed greens. Though they had a good flavor, the creamed greens were just a bit on the tough side--somewhat normal for greens but still just a bit tough. Overall, we had a great dining experience here at Craftsman. We sat outside right at dusk on a pleasant summer evening. Our service was attentive and fast, and the food and atmosphere were both excellent. If I lived closer, I think I'd be here a lot, it was that good. Definitely good eats! I'd heard that Minneapolis has a lot of great places to eat, and if my experience at Birchwood Cafe recently is any indication, that is a very true statement. Birchwood Cafe is a one-of-a-kind place located in the Seward area, a quaint residential area not too far from downtown and not far from the University. It has a certain "college" feel about it and claims to have "good real food." It does! I ate here on a recent Sunday afternoon with my sister who also was my "tour guide" on a brief stay in Minneapolis. Jean is not from Minneapolis either, but her son and his wife live there and so she knows here way around. And she knows good food. After a bit of studying the chalkboard menus, I knew for sure one thing I had to try, the Root Vegetable Soup. A good choice, it was absolutely divine. I am not sure what all root vegetables were used, but I know that Birchwood tries to use locally grown vegetables and products as much as possible. Whatever root veggies were used, this soup was a success in my book. The soup had some tumeric in it which gave it a nice flavor--not overpowering--and a nice color. It was garnished with some bacon--how can you not love a dish with bacon in it-- and served with a bit of hearty bread. It was absolutely delicious. Had no one been looking, I'd have licked the bowl clean. I loved it. For my main dish, I ordered the Furious Bison Sandwich. It was braised bison topped with aged white cheddar cheese, a slice of tomato, a parsley horseradish gremolata, and avocado yogurt on a toasted buttermilk bun. I chose to have it with a mixed greens salad, and it was served with a pickle slice. The sandwich itself, though a bit messy to eat, was delicious. I could tell that the bison was lean as it tended to be just a bit dry, but the overall flavor of the sandwich was very good and I ate every last bit of it. I loved my lunch here at Birchwood Cafe. It seems to be the type of "neighborhood joint" where I'd spend a lot of time if I lived in the neighborhood, especially given the free WiFi access, too! The meal was delicious and the atmosphere warm and inviting without being stuffy. A definite gem of a place in Minneapolis. I should have had the burger--everyone raves about them. But alas, I tried a few appetizers and then was feeling guilty, so opted for a more healthy fare. Silly me. I was visiting family in town, and went to Nutz Deep with my sisters where we also met some of their friends, a regular Thursday night gathering. I wanted to try some "exotic" Wisconsin fare, so ordered the Deep Fried Cheese curds to begin with. I was not overly impressed. Cheese curds are usually of different sizes. This looked like new cheese that had been cut into uniform sizes (true, makes it easier to fry), breaded and deep fried. Now there is nothing bad about deep fried cheese, they just were OK, nothing too special. Next I went on to the deep fried dill pickle spears. They were barely OK. Just nothing at all special about them. The breading was OK. The flavor was OK. Just nothing about them made them very special. We had some other appetizers that I samples. One was shredded onion rings...they were actually quite good. Another as home made potato chips that were covered with a blue cheeese dressing and some onion and bacon... very, very good, actually. Now we're talking some serious good bar food appetizers. For my main course I chose a turkey club sandwich. It was pretty ordinary, starting with tasteless white bread. But hey, it's what I ordered. All around me I saw others ordering and drooling over tasty burgers. I learned my lesson, next time I'll do like the natives do and order a burger. They all raved about them. My sandwich, while a bit more healthy, was a bit more ordinary. Go for the burger next time, go for the burger! Good burgers, great potential, that's how I feel about my recent experience at Line Drive Burgers.I'd heard about this place and visited their web site and even added them to Urbanspoon.com. I am a huge fan of local small businesses and so I wish them all the best. They have great potential, for sure. I went there with three frieneds from work, at lunchtime on a recent Friday. We arrived shortly before noon and were immediately greeted. We spent a bit of time perusing the posted menu and then we each ordered. I found the ordering process a bit confusing. I had to ask for my drink cup, then after I ordered, I proceeded to the drink station. Apparently, I was supposed to go to the "dressing" station first to decide on the toppings for the burger. Among my chosen toppings was onions and i was told I could get them grilled if I wanted. I did. So I chose a bunch of toppings. Meanwhile my friends were ordering, and some being called back to the toppings station. It was just a bit confusing and there was no clear direction. I ordered a single burger with cheese and a drink. I had a coupon for a free fries or chips--I chose the fries. Eventually, my burger was served...but not the fries, I had to wait a bit for them. That was a bit disappointing, i believe in getting all my food at the same time, burgers and fries. But so it goes. So I started in on the burger. First the good. The burger was tasty. And the bun was exceptional. The toppings were very good as well, though in retropspect I wish I'd chosen less toppings. But now the bad. There was a bit too much grease, like the burger was taken directly from the grill and plopped on the bun. And the bun was not toasted--that would have added a lot. The burger was just OK, nothing too fantastic, but still miles ahead of a Mickie-D's. And the wonderful flavor of the bun went a long ways to pleasing me. I was several good sized bites into my burger when my fries finally showed up ( and the delayed fries were experienced by my friends as well). A bag of fries were plopped on the table and I was left to fend for myself. Fortunately, I'd done my homework and knew that the fries were served without adornment (i.e. undresses) and so I went to the condiment area to add some seasoning--blackening for me. If I had not known what to do, I'd have been lost. The fries were good--definitely hot and fresh. I don't believe they were hand cut, the seemed to be run of the mill frozen fries, but tasty and fresh, just nothing to say "special." Overall, I'd have to say my meal was good. I think a few fine points need a bit of tuning here, but it's a new place, only open about a month. When we first arrived, there were all young people working and no one appeared to be in charge. Later I noticed a somewhat older gentleman who appeared to be a manager or owner. They got quite busy at lunch time and things seemed to be going a bit better with him there. So, would I go back? You betcha, but getting less toppings next time and more burger (perhaps a double). And I hope to god all my food it done at the same time next time. With a bit of fine tuning, I believe they could be a real success. A bit more customer training and direction is needed, and bit better food flow, but they've got a winning recipe for success, I hope they make it a home run! I'd heard good things about Cecil's, and they were confirmed on my recent visit there. My friend Tommy and I were in the general area, it was lunchtime, so we stopped in at Cecil's Texas Style Bar-B-Q. Upon entering, we must have looked lost because the gentleman at the counter quickly explained to use what to do: read the menu on the wall, make our selection, get our meat, then add our sides, grab a drink and find a seat. He was very helpful and after a bit of time, we were ready to order. The meat is cut/portioned right in front of you and then you can get your own sides, and they have a nice selection. I ordered the lunch sandwich with two sides, then added an extra side. I got the pulled pork sandwich and it was very good. Part of the fun for me was trying their three house BBQ sauces. I did not like the sweet one too much, but loved the mild when I added just a bit of the hot to it. 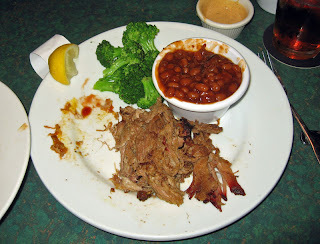 The pork was tender and juicy with a great flavor, very good pulled pork. For one of my sides, I just had to try the jalapeno mashed potatoes--they had been recommended to me. And indeed, they were very good. I sure wish I had that recipe. I also had the coleslaw (yumm) and the BBQ baked beans--they were excellent. My friend Tommy had the brisket sandwich and it was also very good. He thought it to be about the second-best brisket he'd ever had (first was at another local Orlando BBQ place that's known to always have a long line--for a reason). His sides were the sweet tater casserole (yummy) and the potato salad, also delicious. We had a very good meal at Cecil's--it was delicious BBQ. I'd go back, in a heartbeat. Yumm, definitely good eats. The second annual Taste of Sanford will be held on Thursday September 2nd in Fort Mellon Park from 5:30 to 8:30. Last year I was one of the over 500 people who attended the event, and I was totally blown away by it. By the way, the number of tickets is limited, so I suggest you get yours today! The fact that there is a limit is really a plus, because it kept this event from being overcrowded like some other "Taste of" events in central Florida. Last year I reviewed and blogged about my attendance at Taste of Sanford. I had a great time there. The food was plentiful and the lines were not long. Oh, it was crowded, for sure, but it was also a lot of fun. Unfotunately I will be out of town during this year's events, it really kills me that I can't attend. But I'm sure it'll be another great event, based on my experience last year and the list of vendors. I hope you'll consider attending! If you want, you can download the flyer here. Mango Sun Cafe and Grille is chiefly known as a breakfast/lunch spot, but they recently added dinner to their repertoire. So, when my friend Tommy and I were in the area on a recent evening, we decided to take some advice and give Mango's a try. Our dinner there was good. Not great, but it was good. Currently, they only offer dinner on Friday and Saturday nights--we were there on a Saturday night. They were not very busy, but our service was very attentive. I started out with a salad and my friend Tommy started out with a bowl of soup. My salad was good, but the best part of it was the dressing. They said they had a Bleu Cheese Viniagrette. I thought to myself, "how can you make a viniagrette with bleu cheese?" I was skeptical. But I'm a convert now. The dressing was actually very, VERY good! I thought the bleu cheese would overpower the dressing, but I was wrong. However they made it, this was a definite hit in my book. Definitely good eats! Tommy had the soup. I'm not exactly sure what it was called, but I did have a sip and it was very good soup. 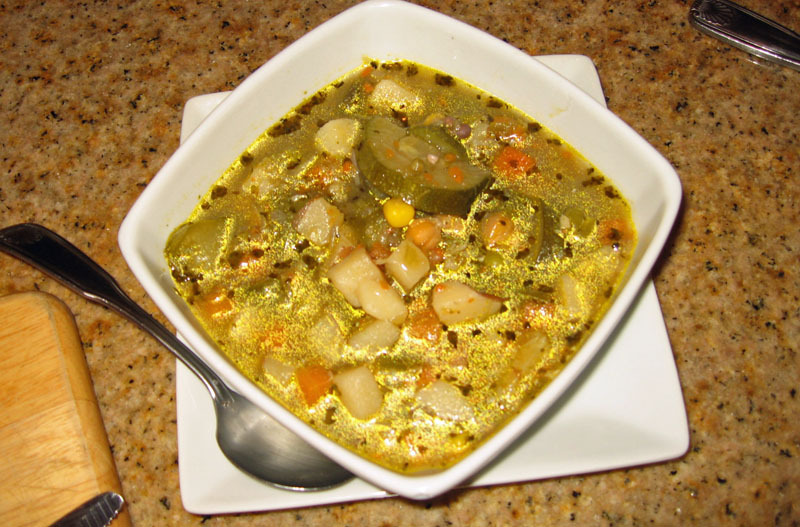 I believe it was a vegetable soup, it had lots of veggies in it but also a nice savory flavor. He liked it a lot. There were a lot of good flavors going on in that bowl, including zucchini and potatoes, among others. Not sure how it was done, but it was good. For my main course I had Barbecue Chicken. To me it seemed somewhat ordinary. The piece of chicken itself looked like what you'd get at a lot of restaurants--you know, it appeared to have those fake grill marks on it, basically painted on lines. The chicken itself was tender. But it seemed just an ordinary piece of chicken that had some barbecue sauce slathered on it and not much more. It was not bad, but it was not special. It was served with a rice pilaf that was good, though also somewhat ordinary, and with some mixed vegetables. The veggies were cooked perfectly, nice and crispy and not at all overcooked. 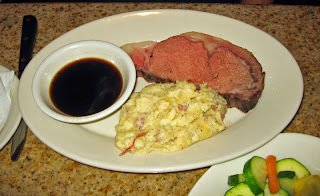 Overall this was an OK dish--not great, just OK.
Tommy had the prime rib. It came out perfectly prepared and with a wonderful jus. It was cooked to a perfect medium, maybe a bit towards medium well, but was nice and tender and juicy and flavorful. It was served with smashed potatoes that were very good. His only complaint was maybe a bit too much salt. But the potatoes had a nice texture and flavor. He also had the mixed vegetables. All in all we had a pretty nice meal here. I'd certainly like to go back and try breakfast and/or lunch here as that's what they're known for. But dinner wasn't too bad either. Top that off with the good service we had and we left as happy campers, another meal of good eats under out belts! We had a good meal in a pleasant setting at Café Murano the other night, and I'd certainly go back for more! We arrived to a short wait around 7 PM on a Friday night. They were quite busy and also had some large tables reserved for some wedding parties. There was a 30 minute wait for inside seating, but it was a pleasantly cool (for Florida summer) evening so we chose to eat outside. It was very pleasant out and not as loud as it got later inside (loud live music). I will note that the servcie was a bit slow. Our waitress, Anna, was somewhat scarce, though there was another gentleman outside that appeared to be a manger of sorts and he was around a fair amount of time to make sure we were taken care of. However, we did indicate we were in no big hurry either, so I'm not sure I can fault the waitress for the slow service either. At any rate, in due time our drink orders were taken. I had a glass of house Merlot which was very good. Eventually we placed an order for an appetizer. 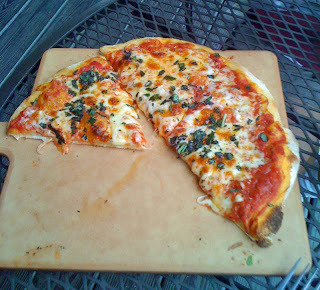 I chose the personal size Margherita Pizza for an appetizer. In due time it arrived and it was absolutely excellent. The crust, first of all, was very good. I believe it was made with butter, I detected a nice buttery flavor to it. It was nice and crispy, thin, and delicious. The tomatoes on top were very fresh tasting and had no canned flavor. The cheese was plentiful and the fresh basil served to give it a last bit of pizzaz. This was truly very good pizza--I think I'd go back just to try a pizza. I also noticed quite a few pizzas being delivered, so I'm guessing that they are a popular pizza place as well. Though we claimed we'd be too full and promised ourselves only a bite or two, we did clean it up before our main courses arrived. It was hard to stop eating it, it was that good! After a fair wait, our main courses arrived. I chose the Chicken Rollatini--a chicken breast (probably pounded thin) that was stuffed with prosciutto, fontina, and mozzarella, and wrapped in pancetta. It was covered with a mushroom wine marsala sauce and served with some very creamy mashed potatoes. Overall, this was a very good dish. I'd say the chicken was just a bit on the not-quite-so-tender side, not really tough, but not really tender either. But other than that, the tastes were spot on. Yes, it was a bit hard to eat, for as soon as I cut into it the cheeses oozed out. No matter, I dealt with that. 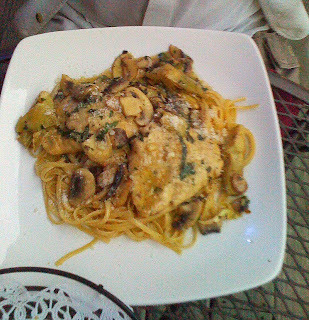 And the mushroom marsala was very good, with a nice and earthy flavor. It also had just a touch of acid and a touch of sweet in it that gave it a very interesting--and good--flavor. I liked this dish a lot. 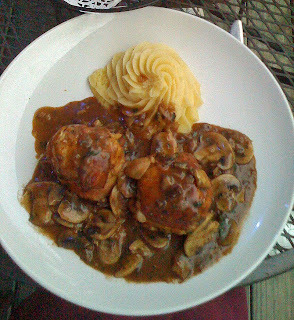 The creamy mashed potatoes worked well to help devour the mushroom marsala as well. All the tastes were very good--a very nice dish, well prepared and nicely presensted, as you can see in the photo. My friend Tommy ordered the Chicken Della Casa, Chicken breasts that had been sauteed with mushroms, artichokes and capers in a white wine lemon butter sauce. It was served over linguini. I had a bite and it was very good, the chicken nice and tender, the acid of the artichokes a great compliment to the buttery lemon cream sauce. Tommy liked this dish--a lot. In the course of the meal--before the entree but after the appetizer, we also had some bread. It was very good, and was served with olive oil that had a drizzle of balsamic vinegar in it and some grated parmesan cheese. This was very good, too, the bread nice and fresh and the olive oil especially fruity. I'm glad we were able to eat outside here. Most summer evenings in Florida would be too hot and muggy for that, but on this day, it had rained and been overcast nearly all day, so was a mild evening, right around 80 degrees. Without a sun to bear down on us, it was quite pleasant. Add to that the nice setting right on Crane's Roost park with all its traffic and people-watching opportunities, and it was a nearly perfect evening. We had a very good meal here at Cafe Murano, and I'd be happy to go back again. The food was good, the service adequate (remember, the slowness was in part attributable to our telling the waitress that we were not in a hurry), and the surrounding atmosphere very nice. I do wonder what it would be like to eat inside--we passed through on the way out and the live music was very loud. But the place was packed, a testament to food and atmosphere--as well as location. Give it a try, I'd go back! It was OK, but just OK. Not bad, but nothing exceptional, that about sums up my visit to Smokey Bones recently. I would say it was just a bit pricey for what I got, actually. I started off with a side salad--that was pretty good and it had a ranch dressing with a kick--it had a nice cumin and chili flavor to it, i liked that. For my meal I ordered the pulled pork dinner. 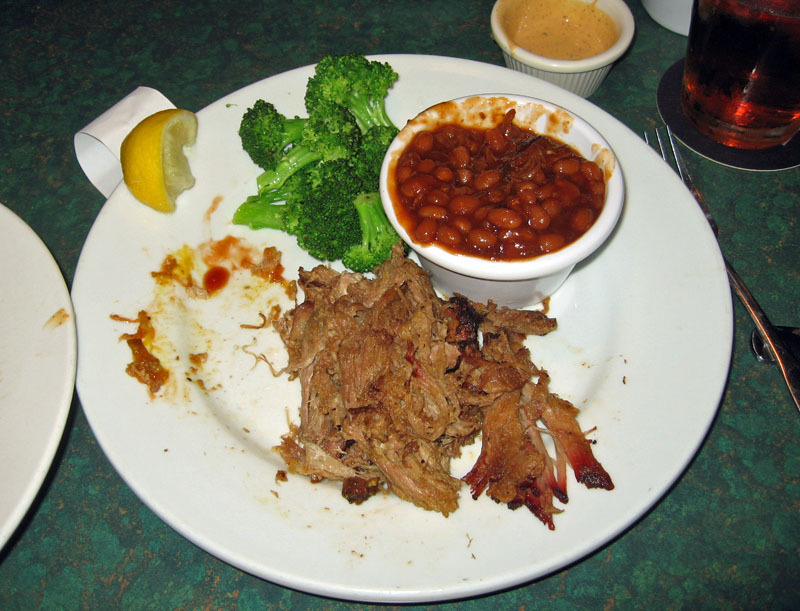 The pulled pork had a nice smoky flavor and was cooked well, very tender and juicy. The portion seemed a bit skimpy for the price and I did find a bit of gristle and other "stuff" in it, a turn off for me. I did like some of the sauces they had, especially the chipotle sauce--nice and spicy--and the North Carolina sauce, though it was definitely western North Carolina. My broccoli was somewhat lackluster, cooked just a bit beyond nice and crispy, but not quite to the soggy stage. It was just OK. The backed beans were killer, however, great taste and flavor, a bit of vinegar, some burnt ends in them, and the beans were nice and firm and not smushy. Overall the meal here was good, but it was not great. I think there is better barbecue around for a better price.